We do test execution in order to understand the stability of a product, so be it manual test or an automated test, it is very important to generate a concise report that can depict the stability of a product. Hence, while we are automating our test scenario with Cucumber, it is essential to know, how better we can generate our Cucumber test reports. As we know that Cucumber is a BDD framework, it does not have a fancy reporting mechanism. In order to achieve this, we need to integrate Cucumber with other open source tool like Ant/Junit. Here, we will take examples of JUnit further because, it provides support for Java language. Local Directory − We can specify target directory for report as any local directory of the machine where the test will run. Server Directory − Also we have a provision to specify a target directory as any directory on the server, which is publically accessible. This generally helps when we want our clients/stakeholders to view the test results at any given point of time. Let’s automate an example of a pretty format. 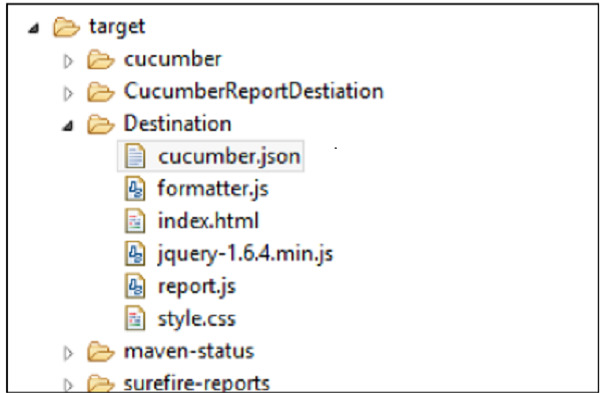 Step 1 − Create a Maven project named cucumberReport in Eclipse. Note − Here scenario first will pass, whereas the second scenario will fail. So that we can witness how the pass and failed report looks like. Create a runner class named runTest.java inside the package. Write the following code. Save the file. //Specifying pretty as a format option ensure that HTML report will be generated. inside the Destination folder, in the target folder of the maven project. You will observe the following things when you run this class file. Both the scenario will get executed one by one. A folder named Destination will be created inside the target directory. The report will be there named as “Index.html”. Open Index.html with web browser. It exactly highlights the color of failed scenario. Moreover, you will see highlight for failed step in that scenario. This makes the debugging very easy. By now we have seen how easy HTML report is. However, if we want to pass on this report information to any other application, that’s kind of tricky in case of HTML reports. Here comes the need of another reporting format. JSON-Java script object notation is another format for generating Cucumber test reports. JSON is an object containing a lot of information stored in text format. JSON reports bring a different value to the table. JSON report can also be used as a payload of information to be transferred between different servers. Further, it can be used to be displayed as a web page. In a nutshell, JSON reports can be used by other application. What is payload information? When data is sent over the Internet, each unit transmitted includes both header information and the actual data being sent. The header identifies the source and destination of the packet, while the actual data is referred to as the payload. In order to generate a JSON report, we just need to make a change in the runner file. Change the format option in the runner file as follows. report inside the Destination folder, in the target folder of the maven project. Right click and select option Run as. 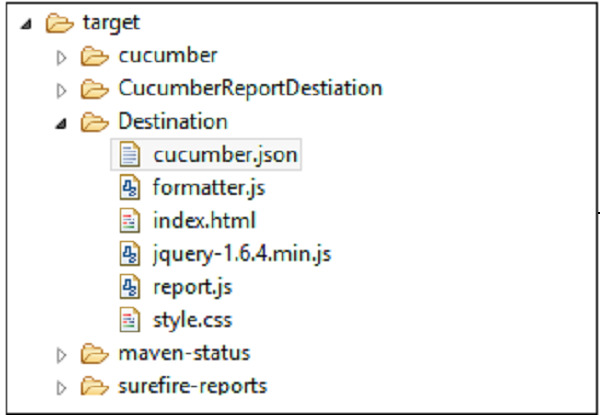 The report will be there named as cucumber.json (as provided in runner class). Open cucumber.json file with the text editor. Note − JSON is less readable as compared to the HTML report format.